Connect History - Connect is proven to deliver better results for students and instructors. Proven content integrates seamlessly with enhanced digital tools to create a personalized learning experience that provides students with precisely what they need, when they need it. With Connect, the educational possibilities are limitless. Power of Process for Primary Sources offers a hands-on critical thinking tool for reading and writing about primary sources. Using a framework to develop essential academic skills such as understanding, analyzing, and synthesizing readings and visuals such as maps. Instructors can select from either 400 preloaded sources or upload their own, leading students toward higher order thinking and writing. SmartBook makes study time as productive and efficient as possible. It identifies and closes knowledge gaps through a continually adapting reading experience. This ensures that every minute spent with SmartBook is returned to the student as the most value-added minute possible. The result? More confidence, better grades, and greater success. There are twenty-eight interactive maps within Connect History that focus students selectively on the key elements of the map. For example, learners can examine the spread of specific crops one at a time, then reconstruct the full global process of agricultural diffusion. Other interactive maps assist students in analyzing periodization, comparing changing political boundaries, and tracing the spread of technology over time. Primary Sources - Connect History’s Image Bank allows users easy and quick access to hundreds of additional primary sources which can be downloaded and incorporated into lectures or assessment materials. The Primary Source Primer is a brief, illustrated video tutorial on how to read and analyze a primary source. As students watch, they are prompted at various points in order to confirm understanding. Critical Missions immerse students as active participants in a series of transformative moments in history. As advisors to key historical figures, they read and analyze sources, interpret maps and timelines, and write recommendations for what do to in this critical moment. After finding out what actually happened, students learn to think like a historian, conducting a retrospective analysis from a contemporary perspective. Introduction to Primary Sources (An Interactive Presentation) is a brief, illustrated tutorial on how to read and analyze a primary source which can be bound into the text or assigned in Connect History. In Connect History the tutorial is a video activity. As students watch, they are prompted at various points in order to confirm understanding. "Individuals Matter” presents a biographical sketch of an individual whose life in some way illuminates the period the chapter addresses. In most cases the individual is a person of public importance. In a few chapters, however, the individual is an “ordinary” woman or man whose life or deeds illustrate some aspect of the period. “Weighing the Evidence" - In every chapter Weighing the Evidence provides students with an opportunity to critically examine a piece of historical evidence relating to the chapter content. It includes questions that prompt readers to analyze, interpret, and discuss the selection. Chapter Opening Vignettes highlight aspects of human complexity through stories of communication, transport, or movement pertinent to the history period under study. The subjects of these stories range widely from camel caravans to the profession of telephone operator. Focus Questions appear at the beginning of each major section. The Introductory Chapter, “The Earth: World History’s Theater,” introduces students to "Afroeurasia" and emphasizes the world's connectedness and breaks down regional boundaries. Key terms are defined in the margins as well as in the glossary. They are also listed with other study terms at the end of each chapter. Change over Time Chronologies help students review each chapter’s significant events. 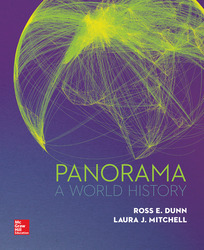 Panorama’s seven parts correspond to seven eras of global history. Within each part, chapters are organized chronologically by consecutive historical periods, never repeating a time period from different regional or thematic angles. “A Panoramic View” maps at the beginning of each chapter provide a big picture overview for the narrative. Within each chapter, additional maps zoom to the regional or local level or provide a variety of global views. New! Connect Insight is Connect’s new one-of-a-kind visual analytics dashboard—now available for both instructors and students—that provides at-a-glance information regarding student performance, which is immediately actionable. By presenting assignment, assessment, and topical performance results together with a time metric that is easily visible for aggregate or individual results, Connect Insight gives the user the ability to take a just-in-time approach to teaching and learning, which was never before available. As part of the Connect Suite, SmartBook makes study time as productive and efficient as possible. It identifies and closes knowledge gaps through a continually adapting reading experience that provides introduces personalized learning resources at the precise moment of need. This ensures that every minute spent with SmartBook is returned to the student as the most value-added minute possible. The result? More confidence, better grades, and greater success. Seven Continents, or Only Five? Beginnings to the First Millennium B.C.E. The Peopling of the World: 7,000,000-10,000 B.C.E. Why Did Homo Sapiens People the Earth? Farms, Cities, and the New Agrarian Age: 10,000-2000 B.C.E. Afroeurasia’s Moving Frontiers: Farmers, Herders, and Charioteers: 3000-1000 B.C.E. Early Odysseys in the Americas, Australia, and Oceania: 8000 – 500 B.C.E. Andean Societies in the Second Millennium B.C.E. PART TWO: AGRARIAN SOCIETIES AND THEIR INTERCONNECTIONS, 1200 B.C.E-300 C.E. Empire-Building and Cultural Exchange from India to the Mediterranean: 600-200 B.C.E. An Age of Giant Empires: 300 B.C.E. - 300 C.E. American Complexities: 900 B.C.E – 900 C.E. PART THREE: SHIFTING POWER, THICKENING WEBS, 200-1000 C.E. WEIGHING THE EVIDENCE The Sculpture of Nok: What Might It Tell Us? Afroeurasia in the Era of Arab Empire: 500-800 C.E. State Power and Expanding Networks of Exchange: 750-1000 C.E. Mongol Murderers: A Deserved Reputation? Was There Something Special about Britain? Why did European Invasions Succeed? Ross Dunn is Professor of History at San Diego State University, where he teaches African, Islamic, and world history. He is also Director of World History Projects at the National Center for History in the Schools. In 1982 he was elected the first president of the World History Association. Ross Dunn has co-authored many books on teaching world history including History on Trial: Culture Wars and the Teaching of the Past (1997) and The New World History: A Teachers Companion (2000). He is currently working on a text for world history with Elizabeth Cobbs Hoffman entitled, The Spinning Planet (2003). Laura J. Mitchell is Associate Professor, Vice-Chair and Director of Graduate Studies in the History Department at UC Irvine. She teaches African history, world history, and theory and method in undergraduate and graduate classes. Professor Mitchell works on making sense of early-modern societies in a digital age, and on making history accessible to diverse audiences. Her research on colonial Southern Africa has been supported by grants from Fulbright, the American Council of Learned Societies, and the National Endowment for the Humanities, the UC Office of the President, and the Mellon Foundation. She served on the World History Association Executive Council, currently serves on the AP World History Curriculum Assessment and Development Committee, and is President of the Forum on European Expansion and Global Interaction. Mitchell is the Editor-in-Chief of History Compass Exchanges. Her book, Belongings: Property, Family and Identity in Colonial South Africa (Columbia University Press, 2009) is available online.